If you ask a customer in a mall anywhere in the world what they think the most important aspect of a store is, the thing that makes them keep coming back, they'll say service before anything else. At GaryTailor.com, we understand that the quality of service that you receive directly correlates with the comfort level that you feel you're at with the clothes you're purchasing. 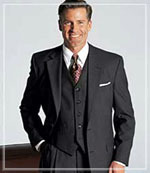 We strive to bring you our tailored suits, custom tailor shirts and other tailored clothing quickly and with precision. We also understand that from time to time you may need changes to be made to your clothes regarding sizing or small little details you've changed your opinion on. With issues like this, we will work with you to make sure that you are 100% satisfied with what you're going to be receiving. There are many benefits to having properly tailored suits and unfortunately, many companies don't put in the effort that we do to make our customers happy. Shop with us today. Many tailoring stores are chain stores that are honestly not very interested or concerned with the complete satisfaction of the custom made clothing that their consumers receive. At GaryTailor.com, we are very devoted to giving the best possible attention to every individual customer that visits us. If you're not happy with the custom tailored mens suits that you received or if you have a very specified question, you can talk to Mr. Gary himself. He is our master tailor and has over 33 years of custom experience. His expertise will help you find the best possible fit and he'll give you all of the customer service you deserve. Check out our custom tailored mens suits and all of the rest of the great things that our services offer on our website.